Note 1: Confirm tire pressure is standard value. 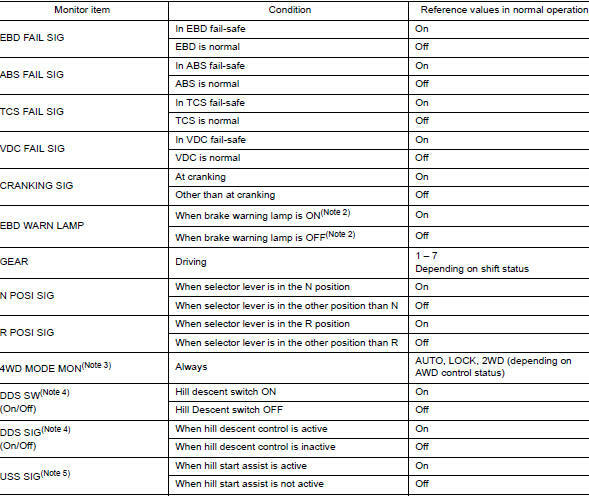 Note 2: Refer to BRC-14, "System Description" for ON/OFF conditions of each warning lamp and indicator lamp. 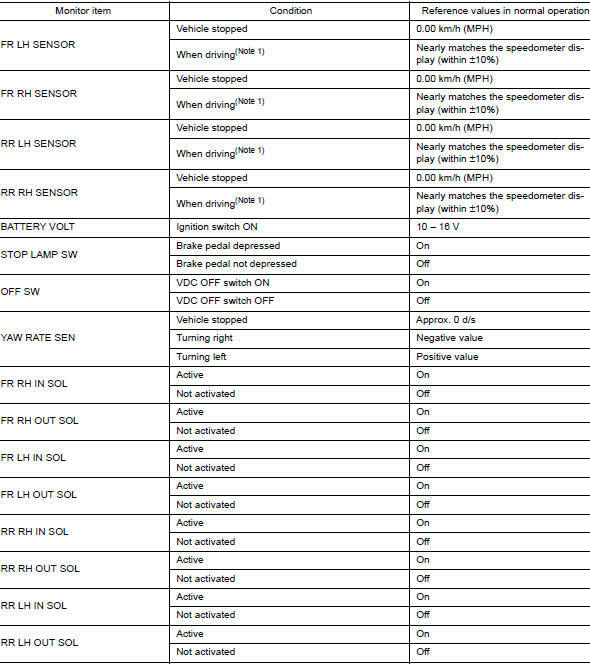 VDC warning lamp in combination meter turn ON when a malfunction occurs in system [ABS actuator and electric unit (control unit)]. The control is suspended for VDC function, TCS function, Brake limited slip differential (BLSD) function, Brake assist function, hill start assist function and Brake force distribution function. 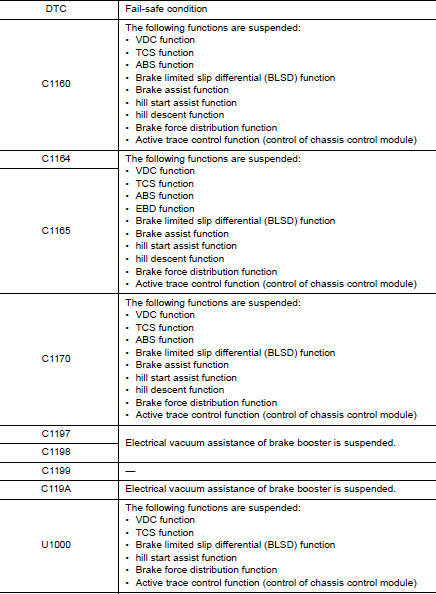 The vehicle status becomes the same as models without VDC function, TCS function, Brake limited slip differential (BLSD) function, Brake assist function, hill start assist function and Brake force distribution function. However, ABS function and EBD function are operated normally. 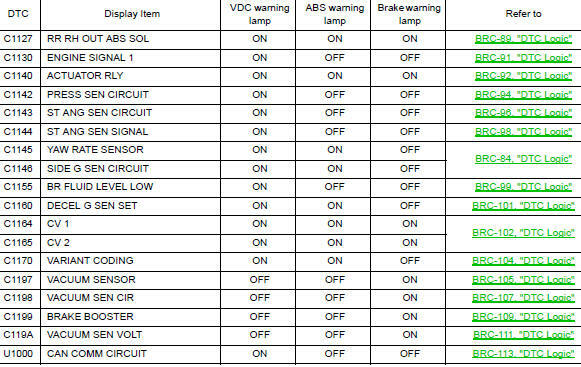 ABS warning lamp and VDC warning lamp in combination meter turn ON when a malfunction occurs in system [ABS actuator and electric unit (control unit)]. The control is suspended for VDC function, TCS function, ABS function, Brake limited slip differential (BLSD) function, Brake assist function, hill start assist function and Brake force distribution function. 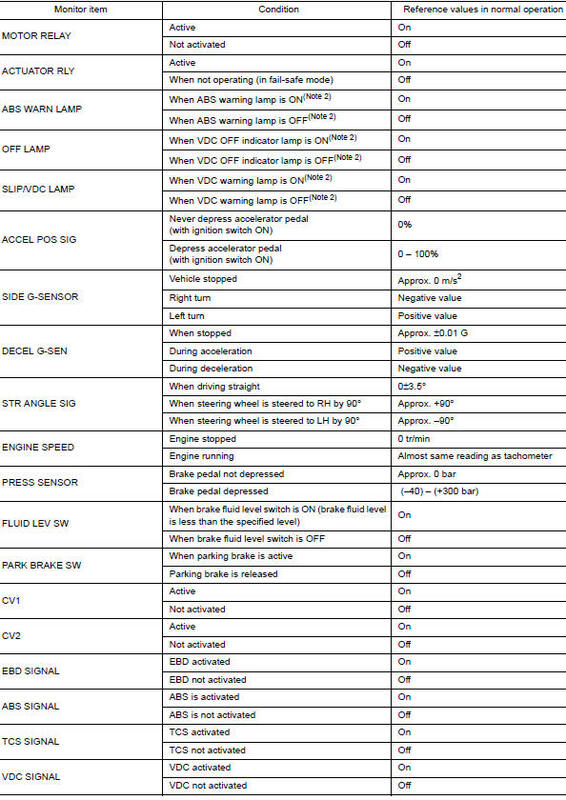 The vehicle status becomes the same as models without VDC function, TCS function, ABS function, Brake limited slip differential (BLSD) function, Brake assist function, hill start assist function and Brake force distribution function. However, EBD function is operated normally. NOTE: ABS self-diagnosis sound may be heard the same as in the normal condition, because self-diagnosis is performed when ignition switch turns ON and when vehicle initially starts. 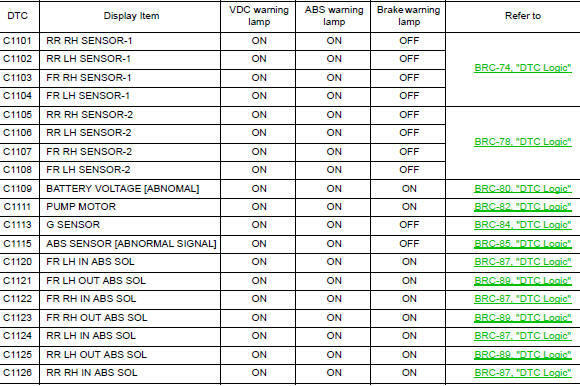 ABS warning lamp, brake warning lamp and VDC warning lamp in combination meter turn ON when a malfunction occurs in system [ABS actuator and electric unit (control unit)]. 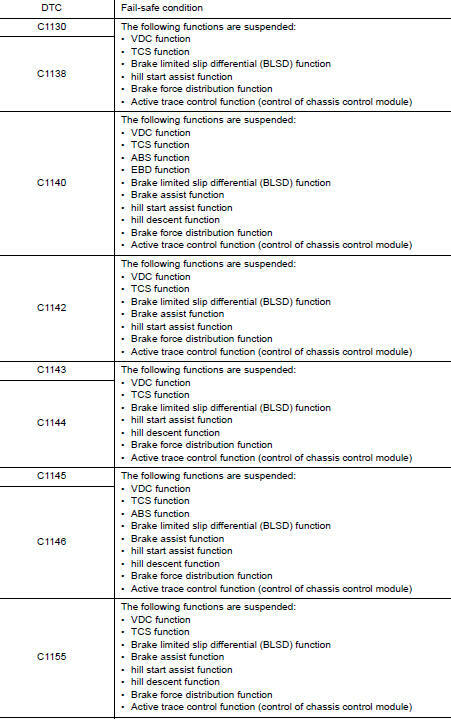 The control is suspended for VDC function, TCS function, ABS function, EBD function, Brake limited slip differential (BLSD) function, Brake assist function, hill start assist function and Brake force distribution function. 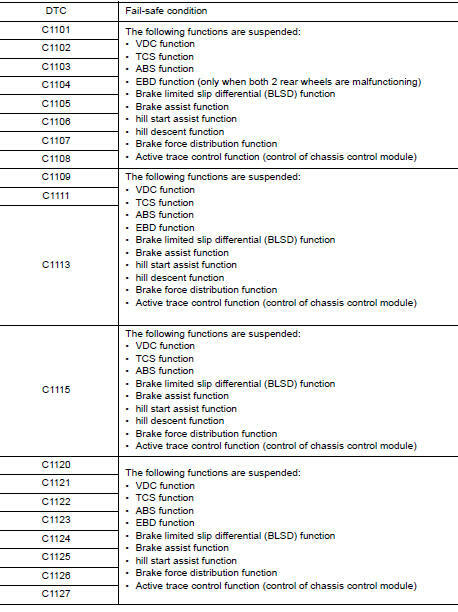 The vehicle status becomes the same as models without VDC function, TCS function, ABS function, EBD function, Brake limited slip differential (BLSD) function, Brake assist function, hill start assist function and Brake force distribution function.